Pete Buttigieg claimed a $7 million haul in first quarter fundraising for the exploratory committee for his 2020 presidential bid — an impressive score for an openly gay candidate who was virtually unknown months ago. The fundraising total doesn’t list the number of donors, but a quarterly campaign finance report with more details is due April 15. In comparison to Buttigieg, Bernie Sanders raised $5.9 million and Beto O’Rourke raised $6.1 million on the first day of their presidential bids. 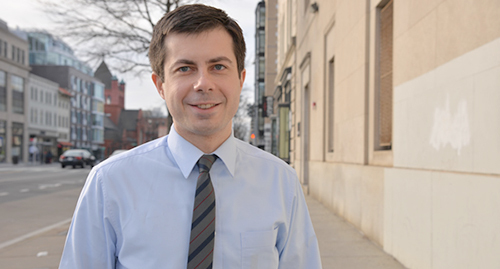 Buttigieg raises numbers as his standing in the polls has increased dramatically. A Quinnipiac University poll last week showed he had support from 4 percent of Democratic voters. Last week, an Emerson poll in Iowa put him in third place in the state, which holds the Iowa caucuses and the first presidential contest of the primary season. But Buttigieg still faces challenges. A report in Politico found Buttigieg lags behind in campaign infrastructure in comparison to other Democratic contenders. “Local operatives said the 37-year-old lags in the sprawling pack of 2020 candidates in building infrastructure in Iowa, New Hampshire, Nevada and South Carolina — a problem that Buttigieg’s campaign is trying to correct quickly as money starts rolling in,” the report says. “That’s not to say he can’t put it together quickly,” Harrison reportedly added.